This lemon herb butter is the most common type of compound butter, which simply means butter with some sort of flavoring or seasoning ingredient added to it—in this case, a bit of chopped parsley and lemon juice. Sometimes you'll hear it referred to as "hotel butter." Typically, compound butter is rolled into cylinders and chilled or even frozen, and then slices or pats are served on steaks, fish or vegetables. In a large bowl, mash the butter with a potato masher or just squish it up with your hands. You can even cream the butter using the paddle attachment of a stand mixer—but the goal is just to get the butter soft so you can incorporate the chopped herbs. Add the lemon juice and chopped parsley and continue mashing/squishing/mixing until the ingredients are fully mixed. Tie the excess plastic wrap at the ends of the cylinder into a knot, or just use little pieces of string to tie off the ends. You can even make a string out of a short section of plastic wrap and roll it into a little rope. Chill or freeze until needed. 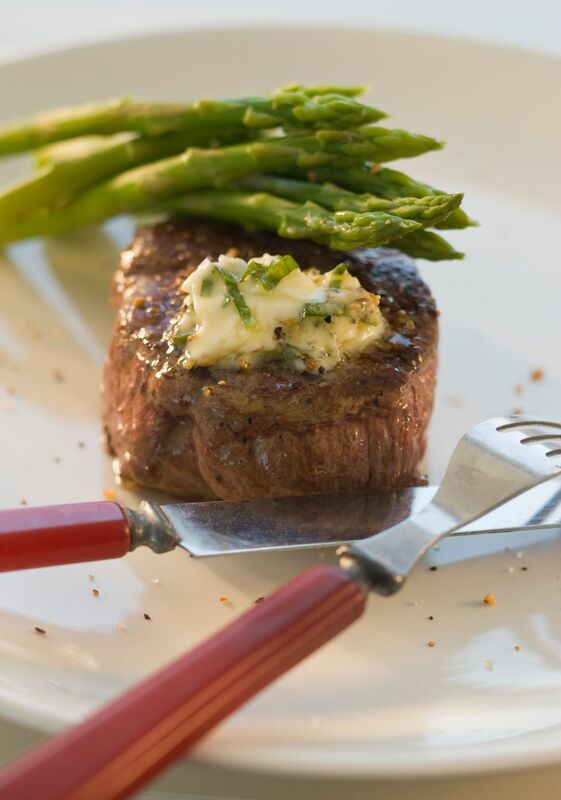 America's 6 Most Popular Cuts of Steak...What's Your Favorite? What is a Flat Iron Steak, and Is it Any Good?